Master network analysis with our Wireshark Tutorial and Cheat Sheet. Find immediate value with this powerful open source tool. Once you have everything up and running, read through the tips and tricks to understand ways to troubleshoot problems, find security issues and impress your colleagues. Even a basic understanding of Wireshark usage and filters can be a time saver when you are troubleshooting network or application layer issues on the wire (or WIFI). Similar to the HTTP export option but able to extract files transferred over SMB, the ever present Microsoft File Sharing protocol. These examples only scratch the surface of the possibilities. Continue reading through the tutorial and start getting more from this powerful tool. Wireshark will run on a variety of operating systems and is not difficult to get up and running. We will touch on Ubuntu Linux, Centos and Windows. Head over to the Wireshark Download page, grab the installation executable and run it to install. Pretty straight forward, you will also be installing a packet capture driver. This allows the network card to enter promiscuous mode. After running an initial capture you will see the standard layout and the packet details that can be viewed through the interface. Once you have captured a HTTP session, stop the capture and try playing with some basic filters and the Analyze | Follow | HTTP Stream options. The filters are easy to read and self explanatory. You simply enter these expressions into the filter bar (or on the command line if using tshark). A primary benefit of the filters is to remove the noise (traffic you don’t want to see). As can be seen here you can filter on MAC address, IP address, Subnet or protocol. The easiest filter is to simply type http into the filter bar, only HTTP (tcp port 80) traffic will now be shown. Try generating a filter combination that shows all non HTTP and HTTPS traffic leaving your local system that is not destined for the local network. This is a good way to find software (malware even) that is communicating with the Internet using unusual protocols. Once you have a number of packets showing HTTP you can select one and then Analyze | Follow | HTTP Stream from the drop down menu. This will show you an assembled HTTP session. In this new window you can see the HTTP request from the browser and HTTP response from the web server. Goal! You are now winning at Wireshark. Continue reading our Wireshark Tutorial for more advanced tips. By default Wireshark won’t resolve the network address that it is displaying in the console. Only showing IP addresses, by changing an option in the preferences you can enable the resolution of IP addresses to network names. This will just as it does when using tcpdump slow down the display of packets as the resolution has to take place. It is also important to understand that if you are doing a live capture the DNS requests from your Wireshark host will be additional traffic that you then might be capturing. This program is often overlooked but is a great way to capture application layer sessions on a remote system. The advantage over tcpdump is the fact that you can capture and view application layer sessions on the fly, as the protocol decoders included in Wireshark are also available to tshark. A quick way to generate command line firewall rules, this can save a few minutes Googling for different firewall syntax. Select a rule, and then head up to the Tools | Firewall ACL Rules. Different firewall products such as Cisco IOS (standard and extended), ipfilter, ipfw, iptables, pf and even Windows firewall using netsh. As long as Wireshark has been compiled with GeoIP support and you have the Free Maxmind databases available you are able to resolve IP addresses to locations. Take a look at About | Wireshark to see what has been compiled with the version you are using. If you see GeoIP listed, make sure you have the GeoLite City, Country and ASNum databases in a directory on your system running Wireshark. Point to the location of the databases in Edit | Preferences | Name Resolution. Test it by loading a capture and selecting Statsitcs | Endpoints | IPv4. The columns on the right should show the location and ASN information for the IP address. Another function of the GeoIP feature is to filter traffic based on location using the ip.geoip display filter. For example to exclude traffic from an ASN you could use this filter. ASN 63949 is the Linode block so the filter now displays only IP traffic not coming from this netblock. Of course you can apply the same filter to city and country based queries. Removing noise from your capture display and allowing you to focus in on the packets you care about. 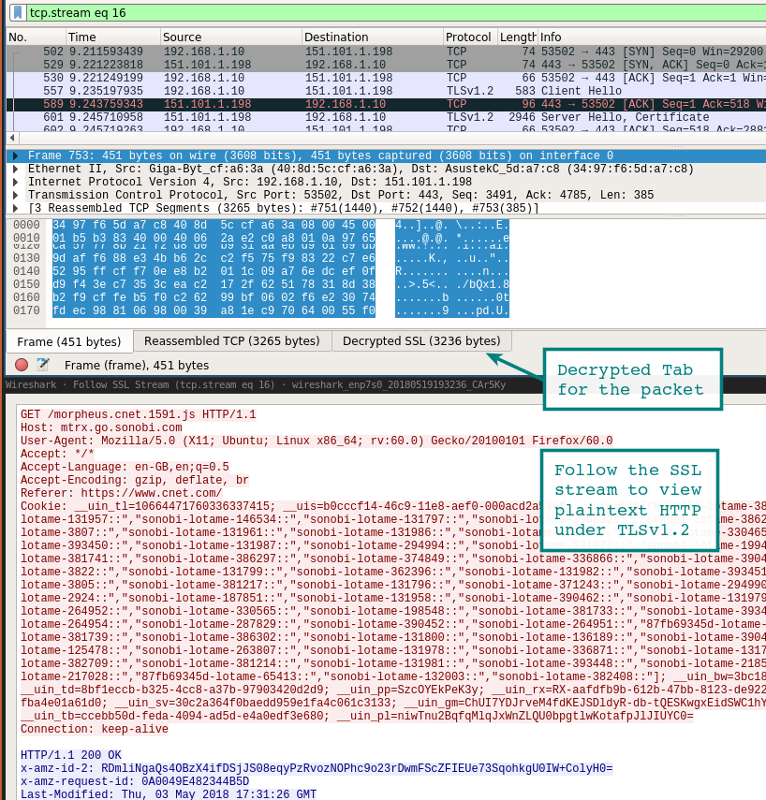 One way of decrypting SSL/TLS sessions is using the Private Key from the server that is being connected to by the client. Using this key, you are able to decrypt the session and view the protocol under the SSL/TLS layer (for example a browser session you could see the plain text HTTP). Now you are not always going to have access to the servers private key. In this case there is another option for easily viewing the browser SSL/TLS traffic from your local system. If Firefox or Chrome are loaded using a special environment variable, then the individual SSL/TLS session symmetric keys will be logged to a file that Wireshark can read. With the keys Wireshark can show you the session fully decrypted for the win! Under advanced system settings, select Environment Variables and add the variable name (SSLKEYLOGFILE) with the variable value as the path to where you want the file saved. From the drop down menu select Edit | Preferences | Protocols | SSL | (Pre)-Master-Secret Log Filename — Browse to the log file you placed in your environment variable. Start a capturing on your local system. After browsing to a HTTPS site. The log file should start to increase in size as it logs the symmetric session keys. Take a look at the Wireshark session that was previously started. You should see something resembling the image below showing the decrypted sessions. You can see the decrypted packets in the tab in the bottom pane. Another way to view the session is to use the analysis drop down and follow the stream. If the session has successfully been decrypted you will see the option for SSL under Stream. It goes without saying, but use caution when logging these keys and pcaps. Someone with access to the key log file and your pcap might very well find your passwords and authentication cookies within the pcap. Another option for getting at the underlying HTTP traffic is using Burp Suite with its CA loaded in your browser. In this case the proxy decrypts the connection on the client side and then establishes a new SSL/TLS session to the server. There are many ways to man in the middle (mitm) yourself, these are two of the most straightforward. It is quite easy to extract files from a Wireshark capture using the export option. The new Window will show any files that were found. In this new Window you can save the individual files or save them all to a folder. A similar method can be used to extract files from SMB sessions. This is the Microsoft Server Message Block protocol that allows Windows File Sharing. Quickly jump to packets based on the color of the main display. For example to find Red – Errors you can see the red line noted in the right hand side status bar and jump to that location with a click. If you are getting started with Wireshark and you are looking for interesting packet captures to explore. The Wireshark Samples page is a great place to start. Enough sample protocols to keep you busy for months and a number of worm / exploit samples for those digging into Network Security Monitoring. A handy tip is to remember that the default console is highly configurable. You can add or remove columns, even adding something as simple as a UTC time column. Which might be immediately useful if you are looking at historical pcaps. The columns can be configured by going to Edit | Preferences | Appearance | Columns. In this area you can also change the layout, font and colors if you desire. This video has good configuration tips for the environment. Including troubleshooting tips and configurations for identifying issues through TCP sequence numbers. This post was originally published in 2011, it has undergone a major and much needed refresh. Wireshark is one of those indispensable tools that many use but few actually master. The rabbit hole goes deep on this one. Source: Hackerstarget Wireshark tutorial and cheat sheet.